These are exciting times to say the least. A brave new voice has risen up, questioning all that we never questioned in our lives. This is not the first time in history we are hearing such voices. Long long ago, when the medieval Church ruled over the state, heretics who questioned the authority were burnt alive. Heretics are like Avatars. They are born everytime at the cusp of a new world order, questioning all the beliefs we were grown up with. Their lives are full of chaos. Think about lives of Krishna & Jesus. I know, what you are thinking. Revolutionaries are not enlightened beings. However, they disturb your lives so profoundly, that you are shuddered to wake up and see the new reality dawning before your eyes. You cannot ignore them. You are left with no choice to bask in the change they are bringing in our lives. 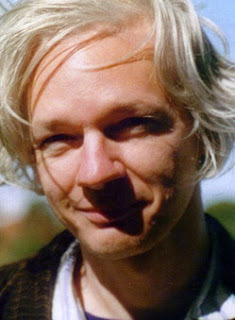 Today Julian Assange is such an Avatar born in today's brave new, digital age where openness and transparency are the gospel truths. If you are thinking why am I romanticizing him too much, you are not getting the whole picture!!!. Thinking about Chaos, I am reminded of one of my favorite dialogues given by Joker in the movie, Dark Knight. “Nobody panics when things go "according to plan"… even if the plan is horrifying. If tomorrow I told the press that, like, a gang-banger will get shot, or a truck load of soldiers will be blown up, nobody panics, because it's all part of the plan. But when I say that one little old mayor will die… well, then everyone loses their minds! Introduce a little anarchy. Upset the established order, and then everything becomes…chaos. I'm an agent of chaos. Oh, and you know the thing about chaos? It's fair. Julian Assange is indeed an agent of chaos!! Thank God for that!!! Can't disagree to that... Wikileaks has shown the ugly side of the moon to all and we are glad that we are still humans. Yeah, you are right. They have opened the pandora's box and god knows what is gonna come out of this...Thanks Siddesh for commenting in my blog:)im honored.. I want to share the documentaries and news videos that people here don't know about.. all the way from the 9/11 truth movement to the iraq war diaries - it all fits in and Wikileaks has been instrumental in initiating the movement for truth. Nice write up Venky. As the protagonist says in Rand De Basanti "Logon ko jagaane ke liye ek dhamake ki zaroorat padti hai". Hope the world wakes up to the truth !